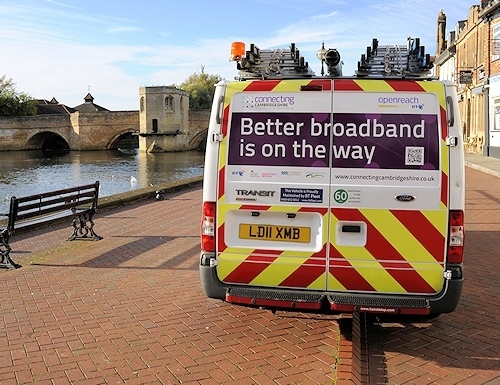 The Community Fibre Partnerships scheme from Openreach (BT), which offers grants worth up to £30K to help co-fund the cost of upgrading a digitally isolated community to receive their FTTC or FTTP based superfast broadband ISP network, has now passed around 80,000 UK premises via 600 communities. The grants are typically focused on smaller or more remote rural communities that don’t currently have access to an existing “superfast broadband” (24Mbps+) network and which may not benefit from one in the near future. Essentially Openreach offers to cover up to three quarters of the cost of the new infrastructure (provided the area serves a local Ofsted registered (or equivalent) school or learning establishment) and then the community self-funds the remaining gap. The grants themselves are worth up to a maximum of £30,000 and this comes from a pot of £2m. In addition, the CFP grants can also be combined with other broadband subsidy or voucher schemes, such as the Government’s Gigabit Broadband Voucher Scheme (GBVS) or the Better Broadband Subsidy Scheme (BBSS) to help bring the total cost down. Some councils also do their own additional grants. “After making contact with Oxfordshire County Council, they pointed me in the right direction for community schemes and government-backed Gigabit Voucher Scheme. And once we took a closer look at the plans, we realised that because fibre cabling would be laid past the village school, we were eligible for Openreach’s own community grant scheme, covering most of the installation cost. We then discovered that because two local businesses were included in our scheme, we could also apply to the government’s Gigabit Broadband Voucher Scheme, meaning we’d raised all the money we needed to go ahead. One other bit of good news about this deployment is that it will be done using their 1000Mbps capable Fibre-to-the-Premises (FTTP) technology. We believe that around three quarters of CFP deployments make use of the slower hybrid fibre FTTC (VDSL2) solution, thus it’s always nice to see “full fibre” showing up. Today’s news follows an earlier report from Regeneris Consulting, which estimated that the UK economic and social impacts generated by Openreach’s CFP could be worth around £340m over 15 years (here). On average, they estimated that £800,000 will be generated per CFP community, although there is significant variation depending on the size of economy and population. We always recommend that any economic estimates about the impact of broadband should be taken with a pinch of salt, not least due to the notorious difficulty of creating a reliable prediction. The smaller communities that have benefited are on average over 130 properties – to me that’s quite a large smaller community. I suspect they are all large enough to have a school, as that is pretty much the only way it is affordable. My area is far too small to be viable (~6 properties). Fastman, Folk will accept any progress possible, but the the notion of not-viable for BDUK is nonsense. There is still over a £1bn of work to be contract and scheduled. These ‘partnerships’ remain a product of a mindset that full fibre is some type of rare privilege to be granted to those who pay the most. This is only sustainable because if the resource constraint. Keep recruiting and keep billing. Every LA is underspent and the Capital Deferral if it was reported this quarter would exceed £580m. All needs converting into FTTP coverage, but I am failing to see any plan to bring this about. Agree with all the frustrations on this thread. We’ve waited 3 years for a non-existent FTTC solution to arrive and then gone via CFP route when told we’ll never get connected to fibre despite the fibre spine being spliced right outside our house at end 2017. Oh the joy of an EO line in a sort of Bermuda Triangle location with FTTC everywhere around us. OR took 5 months to provide quote on a 2 line email for £14k for 8 properties, £7k met by local council grant, £7k to meet and half the people who said they wanted it dropped out leaving the rest of us to pay. Cash now paid and told it will be at least 12 months before we get connected. those that didn’t pay may well be offered connections but it isn’t guaranteed unlike those that have paid. It strikes me that OR/BT have the perfect business model – frustrate the living hell out of the consumer giving them 2-4Mbps, charge full whack for ‘up to 17Mbps’, deny access to FTTC and then rub salt in the wound by connecting it outside consumers’ properties, get consumer to pay £000s for privilege of getting FTTP, tell them it will be at least 12 months then charge the consumer more via BT as a result. OR – the only company that regularly wants a pat on the back for doing it’s JOB! LOL do not often agree with what you say but yes the amount of “nothing” stories BT cones must be submitting to this site it certainly seems that way. This is just another in a long line of them. As expected turning a good BT story into a bad. But that is the role of trolls I guess. Fibre Fred – it is an ok story, but the fibre partnerships suffer from the thinking that fibre access has some super premium, none of the numbers are transparent, and they assume a resource constraint. OR need to get from 500 partnerships in 8 years to constructing c50,000 in-fill FTTP solutions using the monies available. Such a proposal would be welcomed. I was quoted £141,000 for 86 properties.